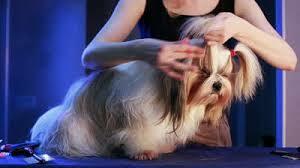 Grooming for dogs is necessary if the dog is to look good and stay healthy. That is right and it can be easily done from the comfort of your home. The first thing to do is to get all the necessary supplies for the task. These will include things like dogs’ shampoo, toothbrush, toothpaste, ear cleaners, and scissors among others. Some tools used may however depend on the dog’s physical composition that is whether it’s big or small or whether it has long or short hair. Once all the necessary supplies are available, the grooming session begins by brushing the dog to detangle mats and brush away the debris. This is necessary, as the mat may be difficult to detangle should it come to contact with water. 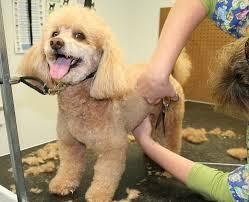 It should also be done gently so as not to make the dog feel uneasy hence complicating the rest of the process. The next task is to address the areas that require urgent attention. These will depend on the dog’s current condition and may include tasks like clipping nails and trimming out mats and unnecessarily long hairs, brushing its teeth, wiping tear stains from its eyes and removing any debris and waxing out the ears. This is done in preparation for the bath to make it easy and fast. Once the dog is in the right condition, the next thing should be to give it a thorough bath. The shampoo should be applied all over the dog’s body after which it should be washed from top to bottom with running water to ensure all the dirt is washed away. Some dogs may however be afraid of running water and may need to be held in place during the bath. It should be thoroughly cleansed to ensure that it doesn’t feel sticky and uncomfortable. 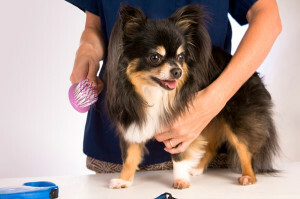 Once the owner is satisfied, that the dog is completely clean, it should be dried thoroughly, and the hair gently brushed down. It may however not be possible for the dog to be completely dry, and as such, the collar should be kept off it until it dries completely to avoid soaring around the neck. The above tips will work perfectly for shorthaired dogs, but long-haired dogs may require that some things be done differently. Here is a closer look. 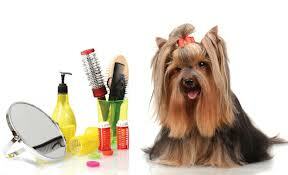 Longhaired dogs demand more attention when it comes to grooming the hair compared to shorthaired dogs. They require more trimming, with emphasis being placed on the underside of the dog to prevent collection of debris from the hair as the dog goes about its activities. The hair may also grow longer in areas like the ears. This can be both unhealthy and uncomfortable for the dog and they should be trimmed to avoid collection of dirt and bacteria. They are mainly admired because of their long hair, and as such, it should be washed thoroughly and conditioned with dog hair conditioner to ensure that it stays soft and sleek for that elegant adorable look. Dogs have their own royal families too, and the Shih Tzu, literary translated to “lion” is one of them. Its royal status and physical attributes require that grooming be done a little differently. For instance, grooming should be done very regularly and unlike other breeds, washing comes first to make brushing the gentle hair easier for the dog. The hair also needs to be trimmed more gently and evenly and for these more sophisticated trimming, tools like an electric clipper are necessary. The rest of the process should proceed normally but with more caution and gentleness that the royal breed deserves. Overall, grooming for dogs is necessary both for their health and comfort and as a sign of appreciation for the faithful friend who is always around when needed. Thanks for reminding that having all the supplies needed is necessary for pet grooming. My sister has a new dog and it’s smelly because she doesn’t have time to give it a bath. My mom suggested bringing it to grooming for dogs service and shared this article with her. © 2019 KanineKlub. All rights reserved. The owner of this website https://kanineklub.com is a participant in the Amazon Services LLC Associates Program, an affiliate advertising program designed to provide a means for sites to earn advertising fees by advertising and linking https://kanineklub.com to Amazon properties including, but not limited to, amazon.com, endless.com, myhabit.com, smallparts.com, or amazonwireless.com.